One of the Assiniboine Park Zoo’s most popular attractions has expanded — by one furry family member. Staff at the Winnipeg zoo welcomed the birth one week ago of a white-handed gibbon, a small species of playful ape that has always been a favourite of visitors — except during a recent six-year absence. 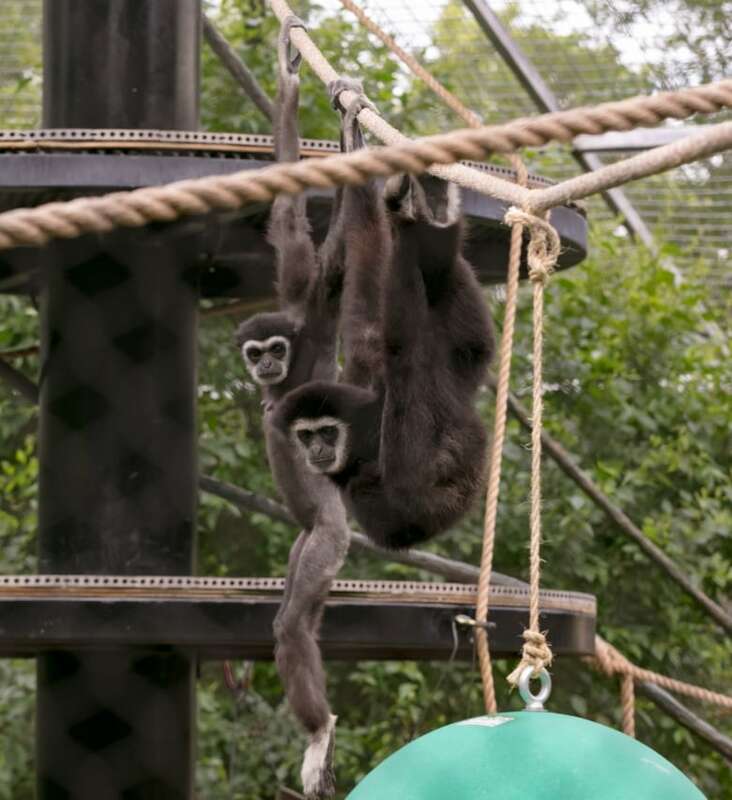 Back now and settled into a new enclosure, the gibbon family is growing. The latest member was born Feb. 4 and will be ready for public viewing on Feb. 14. The baby was born to Maya and Samson, who were matched on a recommendation from the Association of Zoos and Aquariums’ species survival plan program. “Maya and Samson appeared to be a really good match right from the start and we have been looking forward to this possibility for some time, so this is very exciting news for our staff, volunteers and visitors,” said Grant Furniss, senior director of zoological operations at Assiniboine Park Zoo. The gender of the newborn is not yet known because staff are giving the parents time to bond with their baby. The family had been given privacy in an off-exhibit holding area where the animal care team could discreetly monitor them, says a news release from the zoo. “Maya is proving to be an attentive mother and the baby is doing well, so the gibbons have now been given access to their indoor habitat, which is currently closed to visitors,” the release says. The social and vocal gibbons, which have long arms and are extremely agile, enabling them to move swiftly among branches, entertained zoo crowds for generations in Winnipeg. But in 2011, they were shipped off to Safari Niagara, a private zoo in Ontario, after the monkey house was deemed no longer suitable and decommissioned. When the zoo’s Asiatic lions were transferred to England on the recommendation of the European Endangered Species Program (EEP), in the hopes of breeding that species, their habitat became available. The zoo began a long renovation of the space and created a new gibbon home, eventually welcoming the apes back in 2017. Maya, who was born at the zoo in 2011, just before the gibbons were moved out, was brought back. She was joined by 15-year-old Samson, whose father was born at Assiniboine Park Zoo in 1992 and moved to Edmonton in 1994. An endangered species due to habitat loss and hunting, white-handed gibbons are small, tailless arboreal apes found mainly in tropical rainforests in Southeast Asia. They have soft, thick fur that can vary from black to a pale fawn colour and are among the fastest of all primates.